The Right Honourable Thibaudeau Rinfret, P.C. View image details of the Rt. Hon. Thibaudeau Rinfret, P.C. Thibaudeau Rinfret was born in Montreal, Quebec, on June 22, 1879. He was the son of François-Olivier Rinfret and Albina Pominville. He completed a B.A. at Collège Sainte-Marie in Montreal in 1897, then studied law at Laval University in Montreal and McGill University, from which he graduated with a B.C.L. in 1900. Called to the bar of Quebec in 1901, he practised in the province for 21 years, in Saint-Jérome until 1910 and then in Montreal with Perron, Taschereau, Rinfret, Vallée & Genest. He also taught part-time at McGill University for over 10 years, specializing in commercial law. 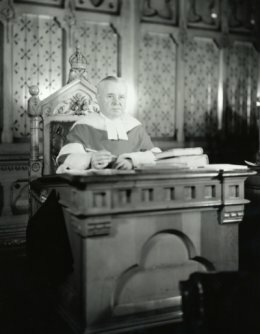 He was appointed to the Superior Court of Quebec in 1922 and elevated to the Supreme Court of Canada on October 1, 1924. On January 8, 1944, he became Chief Justice of Canada. He served on the Supreme Court for 29 years and retired on June 22, 1954. Chief Justice Rinfret died on July 25, 1962, at the age of 83.